Learn to swing dance with Mike & Mary! – Hepcats! Let Mike & Mary put the swing in your step! Why learn from Mike & Mary? 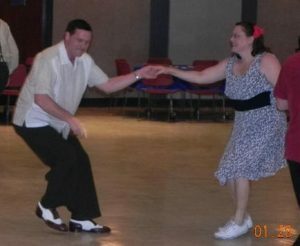 Mike & Mary Richardson have been teaching swing dancing for over 19 years. They don’t just “dabble” in swing dancing: they love the dances and they study the dances. They believe that learning to swing dance is a journey, not a destination. They often travel to out of town swing dance workshop events such as the All Balboa Weekend, Camp Hollywood, the International Lindy Hop Championships, etc…. to take classes, private lessons and compete to further hone their skills. They are the most knowledgeable swing dance instructors in the Lexington/central Kentucky area and are passionate about sharing all the great things about swing dancing, and swing music! (1) Group classes. The Hepcats normally offer a new series of group classes in the Sep./Oct./Nov. and Jan./Feb./Mar. time frames. Keep an eye out on the Hepcats classes web page for info. 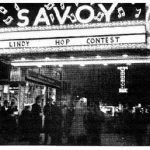 Mike & Mary specialize in the original swing dances of the 1930’s and 40’s big band swing-era: Lindy Hop and Balboa. Note: while Lindy Hop and Balboa are our specialties, we are also very adept in many other forms of dance, to include Collegiate Shag, 1920’s Charleston.